If Kerala was the R&R part of the holiday, then the cultural adventure was supposed to begin in Delhi. And it indeed began with a bang. And a crash and a wallop. 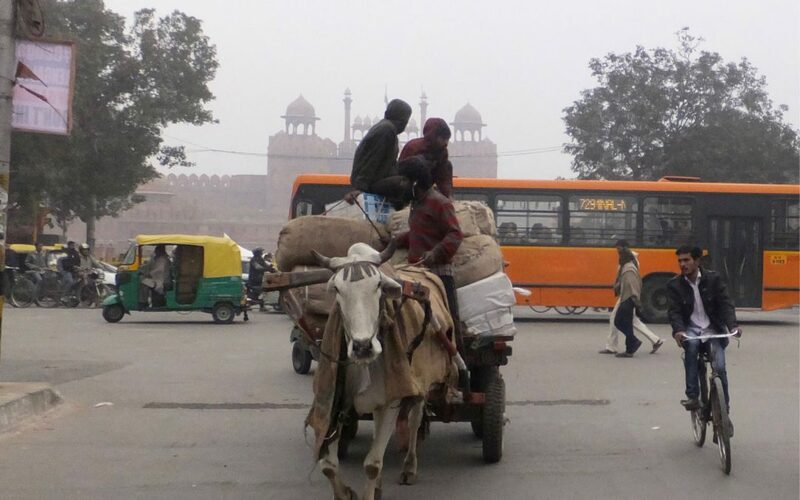 Up at 3.30 am to catch our flight – eek – and arrived at about 11am to a foggy Delhi and a temperature of 10 degrees. Brrr! Met at the airport by the rep from Creative Travel, the partner company for Expensive Travel who deal with the tourists on the ground. The rep was a pleasant lad called Gary who surprised us by telling us that he was doing two years of guest greeting as part of his training and his degree. Degrees get thinner by the day, it seems. Gary walked us to the car park where a sleeping dog and our driver awaited. There we encountered our first beggars, two little lads who seemed to want to shine my trainers. Gary and Sateesh (our driver) bustled us into the car and loaded up the luggage at the back of the car. Now this may not be very interesting to you, but it has a bearing on what happened later. And so we were delivered to the Imperial hotel tired, but looking forward to a day of wandering and chugging about in a tuktuk. The hotel was beyond fantabuloso, and we went up to our bedroom with our check-in lady who went through the necessary form-filling etc. Check-in Lady May I have your credit card, please? John It’s in my briefcase. Me It’ll be with the luggage, I’ll get it. Walks into little wardrobe room. Me No, it’s definitely not here. It must be out here somewhere. Increasingly perplexed, they scan the room. John It must still be downstairs. Check-in Lady All the luggage was brought up, sir. Jaws drop and consternation reigns. FEKK!! FEKK!!!!! AND THRICE FEKK!!! Half an hour later, the hotel had gone round all other guests who’d checked in at the same time, and no, the briefcase hadn’t gone to the wrong room. Meanwhile, I needed to contact Creative Travel and Gary. But the details were all in the briefcase. Along with John’s wallet, dollars, his brand new iPad and my very beautiful and preposterously costly Smythson travel wallet in finest crocodile skin which was a present from the producers of Grumpy Old Woman and which I’d never have bought in a month of Sundays but love dearly. I powered up the trusty MacBook and got Googling. After several attempts, I was on the phone to someone at Creative. They didn’t know who Gary was. Eek! “He’s your rep who met us!”… No, no-one called Gary working here. It eventually transpired that his name is Gurvinder, and the office don’t realise he calls himself Gary at the airport. Hmm. I think he might need another two years of meeting and greeting before he gets his degree at this rate. Well, phone calls were put in, the hotel continued to search, we were shown a photo of the wrong briefcase, and I pined for Bianca in Forward Solutions and Steve Morris in Manchester. I even thought fondly of Mahmood and Mister Abdul and Ahmed from Forward Transfers and Cat the Ground Hostess, all those kindly souls who’d helped us in Abu Dhabi. Even my own resourcefulness was of no use now. At 12.30, we went to the bar, and thus our first G&Ts in India were downed in a spirit of gloom and despair. Gin is not a drink for the gloomy-hearted. Yes, we had our passports, thanks be to Jaysus, and I had my credit cards, even if John’s had gone walkabout. But we dreaded the prospect of sorting the police report and getting the insurance sorted. Cutting a long story short, Gary and Sateesh were located, and both averred very firmly that they had delivered 5 pieces of luggage to the hotel. So then the hotel went back over CCTV footage, and no no no, only four pieces were removed from the car. Naughty Gary and Sateesh. The hours dripped by. Do we cancel everything? I was for cancelling, John was for waiting. We ordered another gin. Then we each ate a wrap and moved onto a glass of wine. Finally and miraculously, the Wandering Briefcase turned up in Lost Property at the airport WITH EVERYTHING IN IT!!! The briefcase had been left – can you believe this – in the basket of the trolley, sitting up as visible as the food on your plate, and they’d left it there, beside the two beggar boys who’d followed us to the car. God, we were grateful for some unknown person’s honesty. And so, just after 4, our briefcase was returned to us, with everything inside it. All’s well etc. Except we were so tired and drained and generally fed up at the ruined day apart from anything else, that we went to bed for a couple of hours. Lunch in our swanky hotel, incidentally, consisting of two gins, two glasses of wine and a wrap each cost £164. Oh, don’t worry, the travel company are paying for that. It’s the least they can bloody well do. Later, we went out for a wee wander, ate dinner somewhere, ate some dal for a change, (ha! I eat it all the time!) and went to bed. And that, dear friends, was Day 1 in Delhi. Taj, our appointed guide, met us for the day’s sightseeing and whisked us off with Sateesh, our driver. First stop was the extraordinary edifice and pigeon sanctuary, the Red Fort. We saw some beautiful Mughal buildings inside, and enough pigeons to rival Trafalgar Square and St. Mark’s Square in Venice put together. And I winced a bit as I heard about all the other Mughal buildings knocked down to make way for British Army barracks. Next, the rickshaw ride through Old Delhi which was exhilarating. 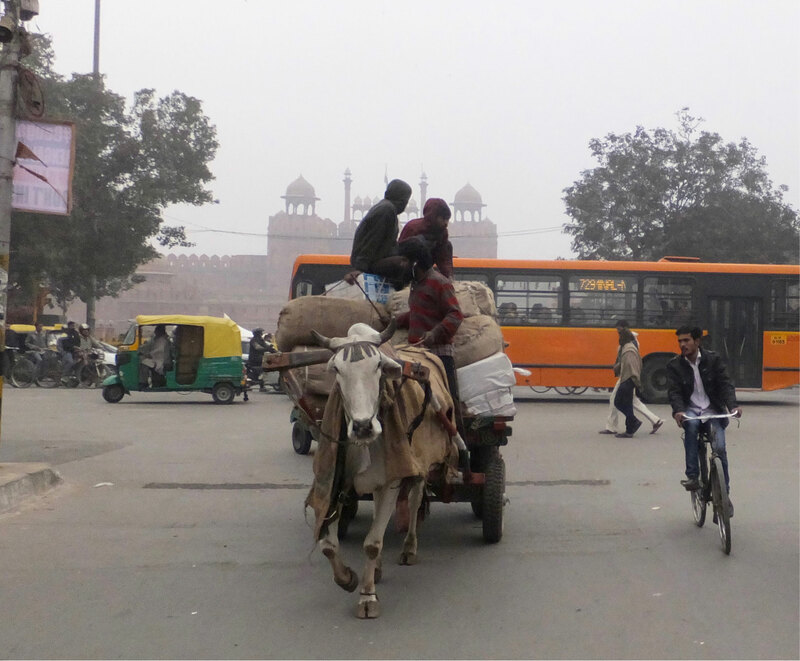 Indian traffic is everything they say (though there were no elephants and few cows) but I haven’t felt a moment’s fear since I got here. I’m a terrible teeth-sucking passenger these days, but here, I just don’t worry. It’s chaos, but they understand what’s going on, and there’s something rather thrilling about being confidently steered into the path of an oncoming bus on the wrong side of the road. “This is the largest mosque in the whooole of India! Wait now, because I am going to tell you something that will surpriiise you VERY MUCH! HOW MANY PEOPLE DO YOU THINK CAN PRAY IN THIS SQUARE? TWENTY FIVE THOUSAND! YES, DURING RAMADAN, YES INDEED, THERE WILL BE TWENTY FIVE THOUSAND PEOPLE IN THIS SQUARE! AND EVEN MORE OUTSIDE ON THE STEPS, BECAUSE NOT EVERYONE CAN FIT IN HERE! No, although I am a Muslim, I must whisper this, I do not pray. I observe, of course, but I do not pray. Actually, he was a decent enough egg, he really knew his stuff, and worked hard to give us a fairly interesting day. Lunch, however, was a dismal affair. Taj announced that we were going to be taken to lunch at Vedas, the same place where we’d eaten last night. We didn’t feel like going there again, the food was awfully rich and we just didn’t fancy it. So we said we wanted to be taken somewhere for a beer and a snack. Taj got on the phone to the Great Minds at Creative Travel. Phone call after phone call was made and received. 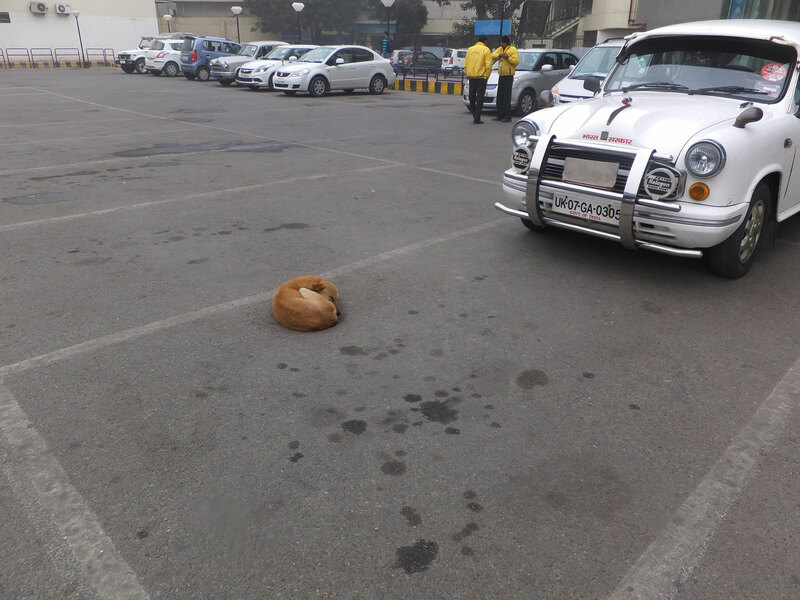 Would you believe it, there didn’t seem to be anywhere in Delhi that we could be taken. No, they could not think of one single place in this massive capital city of a huge and important nation that could serve beer and a light snack to two tourists. Eventually we were taken to a dismal caff with cricket on the telly and formica tables. We had two beers and some rather disgusting dim-summy things. John ate one and grimaced, I ate the other five because I was hungry. As you will find out, I was to regret this. Later that evening, as we tottered into our room, tired after a lot of sightseeing, the phone was ringing. It was Philippa, who’d sold me the holiday all those months ago in London. She’d arranged dinner for us at Bukhara, one of the top restaurants in Delhi, and agreed to meet us there for a G&T. Well, John let her have it in the politest but most direct kind of way. The loss of the briefcase, the fact that no-one had taken responsibility, our rubbish backwater trip, our missed boat trip… It transpires she wasn’t kept in the loop. She’s clearly a bright and interesting person. The great thing about the Beloved Sahib is that when he’s cross, he says his bit and then it’s over, gone, done & dusted, and bonhomie reigns supreme once more. So she joined us for supper and told us about her rather fascinating life out here. Interesting. We’ll be looking out for her novel, India Girl, which has got as far as an agent who is touting it enthusiastically. Ate mouthwatering tandoori shrimps the size of tennis balls and an awful lot of lamb with our fingers. Too much lamb, and greasy fingers. And then Philippa disappeared into the night, having left a token sum of money to cover her part of the bill – well, part of her part of the bill – we were left with 75% of the cost. I don’t think she’s the Big Shot she appears, otherwise she’d have paid for our supper in some kind of recompense for the very very patchy holiday we are having. And now we are en route through the chilly fog (yes, still fekking cold and foggy) to the Taj Mahal. *Footnote: still very few beggars seen, and nor have we been followed by crowds of mutilated children, thank God. Just one amputee, a few eager kids, and one mum with a clearly drugged babe in arms. Dogs everywhere, but they seem to mingle with the community unkicked and unharmed. Not too skinny, and little evidence of mange. I’m very relieved.